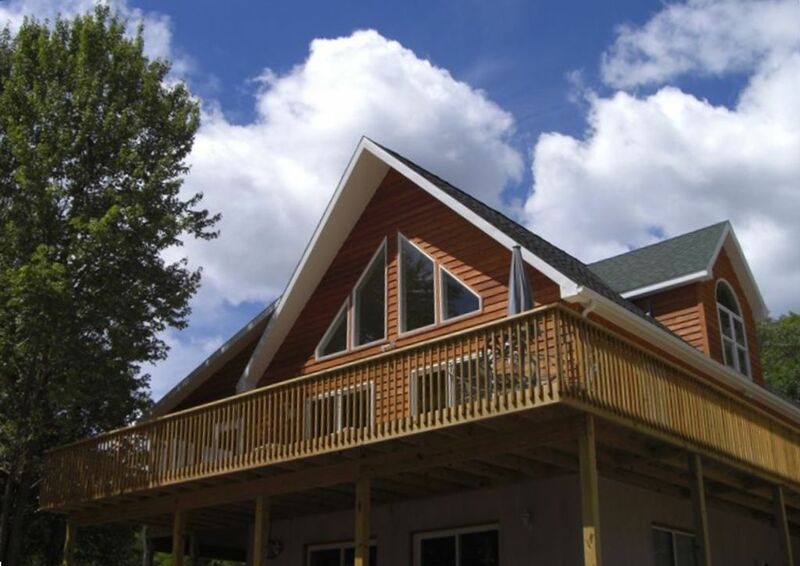 Private, cedar chalet on the ridge on 20+ acres. Gorgeous view of mountains, sunrise, moonrise. Great hiking on property. Four miles from 18 hole golf, swimming, boating, fishing, horseback riding, hiking, kayaking, canoeing. Some of the best fly fishing in the East! Eight miles to town for mineral baths, spa, shopping and dining. 10 miles to C & O Canal Bike Rail Trail. Historic sites and skiing nearby. Hunting in season. Walk to creeks. Pool table/Table Tennis in rec room. Some clear area for outside sports and some trees for shade. Good hiking on property. Two Master Suites -- one with Jacuzzi tub and separate step-in shower, the other Master Suite is in the loft with soaker tub, private balcony and love-seat convertable to twin bed. Three additional bedrooms and two additional baths. A total of five bedrooms and four full baths plus loft studio bed for two. Mini-bar in rec room and hot tub and firepit on the stone patio. Large deck and screened porch. Ceiling fans and air-conditioning throughout the house. Kids swings, Sky Chair and hammock on patio. Sky Mountain Chalet, a romantic, low-cost, relaxing getaway adventure close to home. When my husband and I first went to Berkeley Springs to have a relaxing weekend, we found the area to be energizing and relaxing all at the same time. We loved the area so much we went back again and eventually bought a farm and house we call Sky Mountain Farm. A few years later we built the cedar chalet on the next ridge which we rent to vacationers. Check out our Honeymoon Cabin Fox Hollow VRBO #419811. The Chalet is a great place to stay for two-fifteen people. We hope you enjoy our chalet as much as we do. My husband and I own a hardware store in Maryland and we will be retiring soon when the next generation takes over. We wanted to build a retirement business and since one of our favorite places is Berkeley Springs, we decided that would be a great place for a retirement business. Berkeley Springs has wonderful water, a nice community and is only 90 minutes away. We love the hiking, the wildlife, canoeing on the Cacapon and Potomac rivers, and fishing in the streams. It is a wonderful place to get together with family as kids of all ages can find something interesting to do. Two bathrooms on main walk-in level. One has a walkin shower (small step in). Central heat plus additional portable elec radiator heaters for those wanting to customize their area. Two drip coffee makers and filters. Full set pots and pans, cooking utensils and table setting for at least 13. Nee in 2018: Playing cards, Monopoly, Scrabble, Clue. New in 2017. Weekly professional, independent spa service company checks water levels and chemicals. Two Master Suites -- one on main level with step-in shower and jacuzzi-type tub. Three king beds total, 6 twins some of which are convertible to Euro-kings. We absolutely loved our stay at the chalet! It was everything we were looking for. The view was fantastic. And there was plenty for us to do inside on the rainy day we had. The purple spring blossoms were a real treat too. The house was really nice. Beds were super comfortable,and the hot tub was perfect. We rented this beautiful chalet for a double 30th Birthday celebration. We had originally booked it for 11 people. We ended up with only 9 in the end, but there still would have been more than enough space if all 11 came! The chalet was beautiful and came equipped with everything we needed. We were originally planning on going skiing on Saturday, but instead decided to take advantage of the local area! We went hiking around the property and explored Berkeley Springs, thanks to Jackie’s recommendations! At night, we enjoyed playing ping pong, using the hot tub, and cooking dinner in the beautiful kitchen. Jackie was super responsive. The rooms were beautiful and we especially loved how many bathrooms there were for a big group! We also appreciated Jackie’s specific directions for how to find the house; it was super helpful as we arrived late at night. Couldn’t have asked for a better place to have a relaxing birthday celebration for my husband and his best friend! Three generation family getaway for MLK weekend and this worked perfectly. Lots of beds, sitting areas, extra bedding, towels, fully equipped kitchen, game rooms, books, puzzles, cds, dvds. I could go on and on!! Jackie was great to work with and very responsive to any questions I had leading up to or during our stay. Thank you for such a nice review. It was a pleasure hosting you. I'm glad our Chalet worked so well for you and your nice family. Great get away from it all location. Beautiful large house in a beautiful part of WV. The house is far away from it all, but still convenient enough to Berkeley Springs shopping and restaurants. The house is warm and cozy with plenty of room for your large family or guests. We especially appreciate how flexible the owners are! They responded quickly to our requests and worked with us on our family needs. We enjoyed a wonderful Christmas at the Chalet. Thank you for your nice review. We enjoyed setting up our holiday lights for you and pleased you had an enjoyable Christmas at our Chalet. Mountain view. Watch the sun rise and the moon rise in splendor from the large deck or the dining and living room, or master bedroom and loft and lower level patio with hot tub and firepits! So many beautiful views from Sky Mountain Chalet. Holiday weekends may be higher with longer min stays. Weekly rentals changeover usually on Fridays. For 6 guests or fewer, ask for cleaning discount. Delivery of starter wood for fire pit is included. Professional independent spa service for hot tub weekly included. Professional independent preventative pest control service included monthly.